This post contains affiliate links. The TENS therapy unit discussed in this post was given to me for free in 2014. Way back in 2014, a company called Omron contacted me and asked if I would review their TENS unit. At the time, I’d never even heard of TENS. I learned that TENS stands for transcutaneous electrical nerve stimulation and is a method for treating pain. I agreed to review their product, but since I didn’t have any personal issues with pain, I gave the unit to my mom and wrote about her experience with it. No issues with pain – ha! Ironic, right? The thing is, I’ve had some degree of lower back pain since I was 23 years old (so for almost 20 years). It just goes to show that many people with chronic pain think differently about pain than those without it. I didn’t understand until recently that we adjust our view of normal. For many, like myself, we don’t consider it “pain” unless it’s acute or incapacitating – different from our everyday pain. Physical therapists and other healthcare professionals have been using TENS therapy as a form of pain relief since the 1960s; yet it remains controversial, with some researchers dismissing its effectiveness. My mom tried out the TENS unit for me. She used it for ankle pain, and for a while it provided her with some symptom relief. Eventually, her pain needs surpassed what the TENS unit could provide, so it got stored in a drawer somewhere. Fast forward a couple of years and one major surgery later. In the two weeks following my spinal fusion in May 2016, I experienced the worst pain of my life. 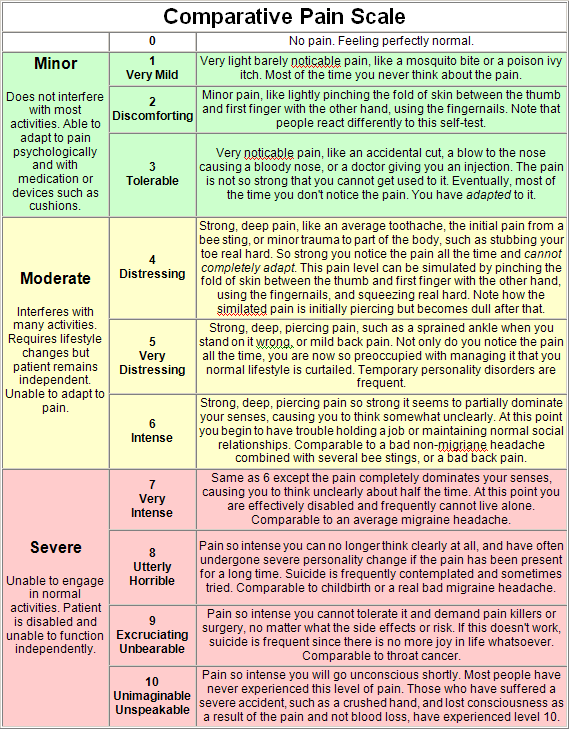 Using this pain scale, it was at times a 9 out of 10. This is not intended to frighten anyone who is pre-op or considering a spinal fusion. My experience was not uncommon, but I also know people who felt immediate pain relief after surgery. Everyone is different, and the pain DOES get better. I promise. Anyway, the most severe pain was not even in my back or at the surgical site – it was nerve pain in my left leg. Nerve pain is different than other types of pain – for me, it felt like shooting, burning, ache deep inside my leg. For other people, it can feel like stabbing, prickling, or tingling. I had nerve pain before surgery; but oddly enough, it was only in my right leg and hip – never in my left leg. This new pain was very scary for both my husband and me, but my surgeon assured me that about 10% of patients experience post-op leg pain. I’m not sure of the accuracy of this statistic, but it made me feel a bit better. After surgery, I was prescribed 10-20mg of Percocet every 6 hours and a muscle relaxant called Robaxin. The Percocet was barely touching the pain, especially since I had to wait so long in between doses. At the most, I was maybe getting two hours of pain relief from it. On post-op day 5, my surgeon called in a new prescription of 10mg of Oxycodone. Unlike the Percocet, it didn’t contain any acetaminophen, which meant that I could take it more frequently. Percocet contains 325mg of acetaminophen, and the maximum safe dosage of acetaminophen is 4000mg/day – although my surgeon preferred me to keep it below 2500mg. Also of note – I was not allowed to take ibuprofen for 6 weeks post-op, as it can inhibit bone growth (and I needed to grow some new bones!). The TENS Unit! I had no idea if it would help or not, but I was pretty sure it couldn’t possibly make things worse. My daughters had been staying with my parents and were returning home the following day, and my mom promised to send the unit home with them. So, look. I don’t know if it was the actual TENS unit, or the placebo effect, or if my pain simply improved on its own with time. But whatever it was, after using the TENS unit, the pain relief came quickly. It certainly didn’t make my pain go away, but it did help reduce it to a more tolerable level. And from that moment on, my TENS unit was my best friend. I tried not to overuse it (as per guidelines), but I used it as often as possible. Laying in bed, walking around the house (if you can call it that – I was still barely hobbling from my bed to the bathroom at that point), even sleeping. It was glorious. I don’t remember exactly how long I used it, but it was definitely a recovery staple for several weeks. Eventually my pain improved enough to where I didn’t need it anymore. I hadn’t thought much about my TENS unit until the other day, when I decided to give it a try for my new/old back pain. I’m not sure if it actually helped much in this case, but it was oddly comforting – perhaps it triggered a positive feeling based on my prior experience, or maybe it just provided a welcome distraction from my aches and pains. In researching for this post, I came across a 2009 study claiming that TENS therapy is not effective in treating chronic back pain. That may indeed be the case. However, the same study found that TENS can have some positive effects on nerve pain. And for many of us with back pain (those of us with spondylolisthesis in particular), back pain and nerve pain go hand-in-hand. The great thing about TENS is that it doesn’t carry the risk of more invasive and potentially addictive methods of treating pain. It’s also relatively affordable. 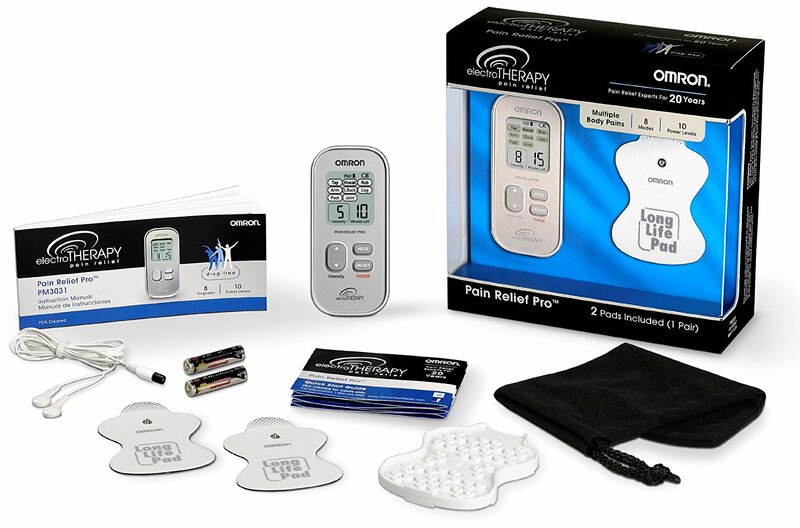 The newest version of Omron’s Pain Relief Pro (the device that I own) costs around $45, but they have less expensive models as well. And quite a few other companies make portable TENS units, some starting at around $25. Before buying, I’d suggest checking out the price of replacement pads. Pads are generally cheaper if purchased in bulk, and some units may work with generic pads. I needed replacement pads in a hurry and was nervous to purchase an off-brand, so I ended up paying $20 for a pair of them. If you plan in advance, you may be able to get a better deal. Also, see if your insurance will cover the expense or provide you with a device. Mine did (but I didn’t need it since I already had one). 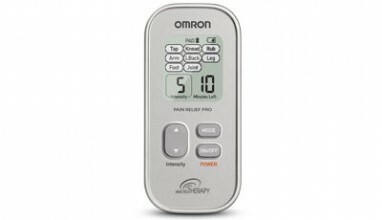 So thank you to Omron for the product that I didn’t need – until I did. It’s weird how things work out sometimes, isn’t it? I am looking for very specific information. I have L3-L4-L5 fusion and have the titanium rods and screws in my back. Did you use your TENS unit in the vicinity of, or right over where your fusion occurred? If not, where did you use your TENS? Hi Matt. No, I didn’t use my TENS unit near my fusion. I used it on my legs to help with nerve pain. I have used it on my lower back to help with SI joint pain, but I only put it on one side at a time. I seem to recall reading that you’re not supposed to use it near your spine, but I’m not positive. Can anyone else weigh in? The aleve active relief unit is the easiest one to use. It is one piece with two aaa batteries and a remote with a 2032 battery. It is best to use when laying down so it doesnt come off. It is very sturdy….no wires but costs $60.